Read the review of Haier 6 kg Fully Automatic Top Load Washing Machine (HWM 60-10) and know what features this fully automatically washing machine holds. Know what performance to expect from it and what all are its capabilities. Haier is a highly trusted brand in washing machines and an average model of Haier washing machine easily runs nearly a decade. If you are thinking about buying an Haier washing machine and looking out for a review of Haier 6 kg Fully Automatic Top Load Washing Machine (HWM 60-10) then we are here to help you. Without further ado, let's dive directly into the details of this 4-star energy rated machine. 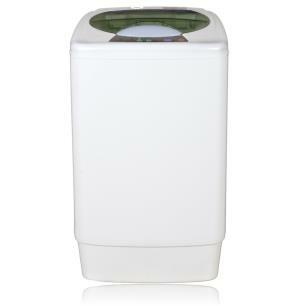 This is a top loading fully automatic washing machine. The top panel comprises of a multi-LED display which will give you information regarding the cycle of wash that is currently running along with the time remaining for the wash to complete. The lid glass is transparent and temper proof so you can see what is going on with your clothes directly and don't have to worry about the glass getting scratched easily. The outer body is made completely of plastic so you need not worry about keeping it in the bathroom as it is not going to catch any rust. In addition to that, the body is shake and dent proof. There are in total 6 wash programs with this machine. These are Standard, Gentle, Jeans, Quick Wash, Wash, and Spin. This means if you are in a hurry and want your dirty clothes to be quickly ready, then there is no one except HWM 60-10 to get your clothes ready more quickly. The quick wash feature will get your clothes ready to was (except for ironing) in just 15 minutes. Haier Washing Machine HWM 60-10 is able to analyze the washing environment and able to adjust accordingly to get the best wash results. There is a Foam Analyzer in the machine that can detect the density of washing powder in the water and accordingly adjust the rinse time so that you don't get any washing powder stains on your clothes or any allergy from the detergent. Nothing unique but the machine does have a memory wash feature which means that even if you shut the power off, on again switching on the machine the wash would try to continue from where it was abruptly stopped due to power failure. To keep the wash gentle on your clothes the tub is designed to be soft on your clothes near the bottom whereas the top has fine holes to let the floating lint and dust to flow away during the wash cycle itself. So in case you are going to clothes which are delicate, it will be a good idea to not fill the tub till the top, rather keep the tub half empty. The spin speed of the tub is 1000 rpm. Once you take out the clothes, it barely requires 15-20 minutes of direct sunshine to completely dry the clothes. The motor of the machine comes with a 5-year warranty and the machine itself comes with a 2-year warranty. Once you buy the machine, within a day you would get a call from Haier customer service executive to schedule a visit for demo and installation. This visit is completely free of charge. In the case of any issues later, the warranty is onsite warranty means the service engineer would visit your home for free in case of any issue. Haier is a reputed brand in washing machine industry which guarantees good build quality and service guarantee. Very quite in its working, be it during wash, rinse or spin. Quite compact in shape, takes very little space wherever kept. Quite simply to use with auto controls taking care of most of the cycle.